Express Entry is a point-based immigration system of Canada. It has won praises worldwide for being the most organized, hassle-free and successful immigration system in the world. 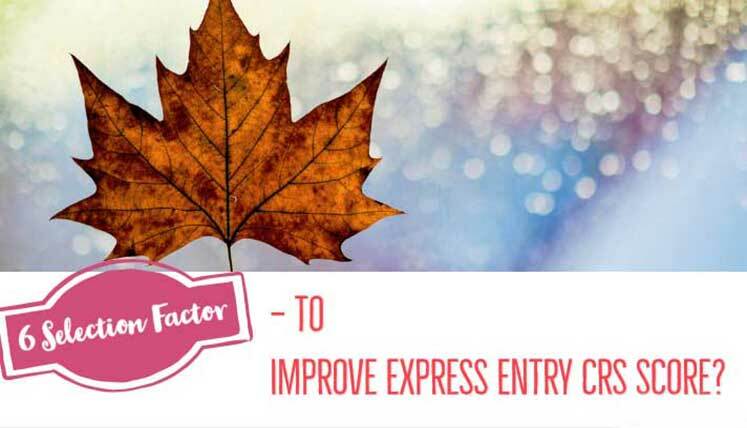 There are six selection factors in the express entry which decides what will be the point score of an applicant. The cumulative of these is calculated for deciding applicants’ eligibility for the program as well as for determining whether or not invitation to be sent to him for visa. Hence, the point score acquired based on profile factors plays a vital role for an applicant’s express entry application. However, a key question here is, which express entry selection factor is flexible enough to raise your total CRS (Comprehensive Ranking System) points in Express Entry System. Flexible Selection factors to increase CRS score? Now, which selection factor do you thing flexible, i.e. making changes in which you can improve your overall FSW point score or CRS (Comprehensive Ranking System) score. Let’s find out. Education- well education can be upgraded, but that doesn’t happen in few days or weeks, it takes years to get a new degree and earn points based on the same. Work Experience- Same goes for the work experience, you cannot change your work experience overnight. You have to spend valuable years of your life in any occupation to gain the experience based on the same. Adaptability- adaptability points are basically the points given if you or your spouse share any past connection with Canada. So, this is also one thing, you can’t obtain in days or weeks. Employment offer- Employment offer from Canada, you can get at any point of time, however, it is not the easiest thing to obtain an employment offer from a Canadian employer. In fact, no compulsory job offer requirement is one thing that makes the Express Entry so popular immigration system in Canada. Hence, not all applicants prefer this option. Language Ability or Proficiency- Well, this is one thing you can enhance to subsequently increase your Express Entry CRS points. Let’s find out more about this factor in detail. How Language factor can help you increase your CRS score effectively? As an applicant, you sit in IELTS or other similar tests to gain minimum CLB 7 level of proficiency in English or French as a primary language. However, if you can better your IELTS band score in all four abilities, i.e. listening, speaking, reading and writing, you can get additional CRS points for the same. Learn the Secondary language- You can also earn valuable points if you know the competent level of French language and claim points for the same. In fact, you can earn up to 30 points for your French Language skills. Spouse or common-law partner- you can also earn up to 20 points for official language proficiency of your Spouse or common-law partner. As far as highest CRS points earning is concerned, that you can get through provincial nomination only and not through any selection factor. The provincial nomination from any Canadian province can get you 600 additional CRS points in the express entry. To get vital assistance and support regarding improvising your CRS score and consequently, obtaining Canada PR invitation from IRCC, you may get in touch with most qualified and experienced Canadian immigration experts and professionals at Visas Avenue. Visas Avenue migration experts on Toll-Free Number- 78-18-000-777. Moreover, to get your eligibility checked and subsequently, get a call from the expert, you may fill the free assessment form.